Medication organizers, aka pill organizers, can be lifesavers–literally. For those who have serious health conditions, forgetting to take the right pill at the right time can cause potentially catastrophic consequences. Weekly pill organizers. The Seven Day Pill Organizer and Planner lets you organize and store four doses of medications or vitamins for each day of the week. 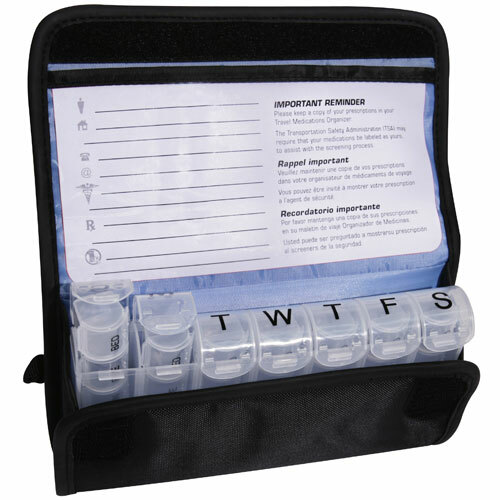 This thoughtfully designed system includes seven pre-labeled spring-loaded pill storage cases, a reminder card for documenting vital information, and a handy carrying case that closes securely with Velcro for safe storage and transport. Monthly pill organizers. The MedCenter Monthly Pill Organizer is specifically designed to prevent double-dosing or missing a dose of important medication. It features 31 daily pill boxes that each have four separate dose compartments, a front storage tray to hold that day’s pills, and enough storage capacity for even heavy daily medication regimens. The dose compartments are pre-labeled to organize pills for morning, noon, evening, and bedtime doses. Easy-open lids make it easy to access pills in each pill box, and the boxes have red and green color coding to show when daily doses are complete. A front storage compartment on the organizer holds “Today’s Pills” to avoid confusion and prevent missing a day. Travel pill organizers. 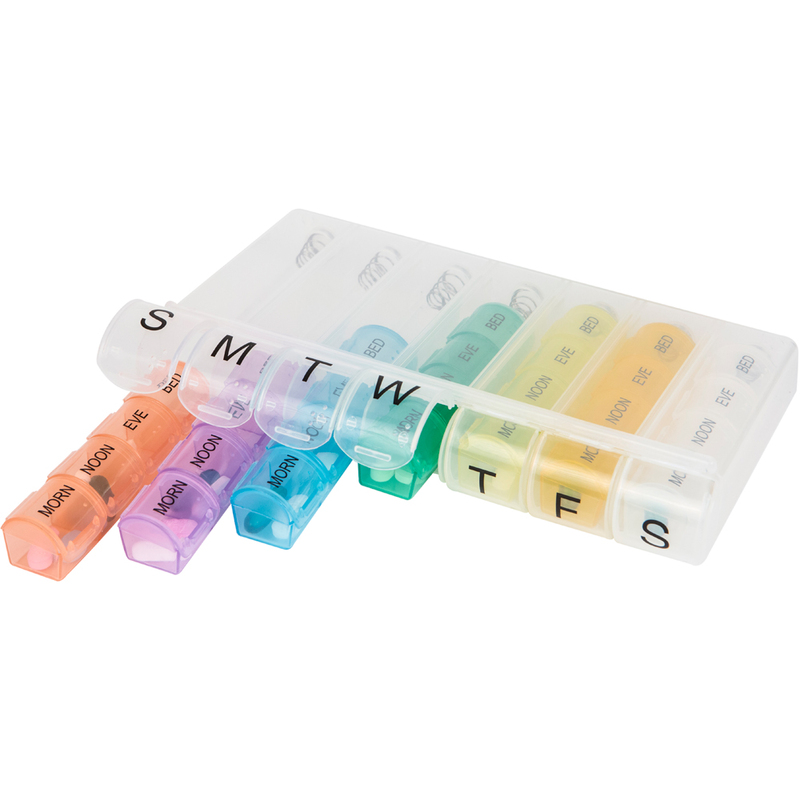 The Divided Seven Day Pill Organizer consists of a clear plastic case containing seven separate pill containers (each a different color) with compartments for morning, noon, evening and bedtime medications and supplements. Each daily pill box can be managed separately and pops out with a spring for easy access. The compartments and the case have secure closure tabs to keep pills in their place. The organizer is a compact 8 inches wide by 1 inch high by 4.25 inches deep, so it fits neatly in a handbag or carry-on luggage. For other ideas about medication organizers, read my post on Vitamin and Medicine Bottle Organizers. Q. My husband takes about 20 different vitamins and supplements and the bottles are always cluttering up our kitchen counter. He also sometimes has difficulty opening and closing the bottles. So I’ve been trying to find an organizer-dispenser that can accommodate up to 20 separate batches of large tablets and capsules. But all the ones I’ve seen are either made for small pills or they don’t have enough compartments. Do you have any suggestions? The only drawback is that this is not a totally air-tight container; therefore you might want to store it inside a cupboard, on the most accessible shelf. More ideas for vitamin and pill organizers can be found here.